On the 10th August 2010, our friend, colleague and teacher Eimear Treanor passed away after a tremendously brave fight against her illness. Eimear grew up in Newry, Co. Down. In 2004 Eimear decided on a change of career and trained as a primary teacher in Canterbury Christ Church, University College, Kent to fulfil her dream. In October 2005, Eimear joined us here at SS Peter & Paul JNS and it was as though she had always been here. She took to teaching like she was born to it. The care and planning that went into her work was immense, but above everything else was Eimear's strong belief in focusing on the positive. 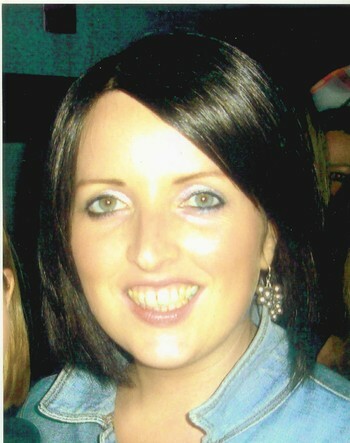 In teaching the children in her care, and in her life, Eimear's motto was "focus on the positive". She was one of the most postivie people you could ever have the privilege of meeting. Eimear also believed in the importance of teamwork. She valued it greatly and she shared so much with us-her time, her ideas, her skills and of course her passions-her family, her friends, travel and the craic! Eimear was a gifted, inspirational teacher, with a great sense of humour. When she was asked what she would like a child she taught to say about her twenty years on, Eimear replied: "That learning was fun". We can say with certainty that all of the children who were in Eimear's care had that wonderful expereince of learning being fun. That was Eimear! It's hard to believe that such a special person has been taken from us, but as we go about our daily work here, passing our picture of Eimear with her wonderful smile, we can feel her enthusiasm and hear her infectious laugh and we know that her spirit is here, deep in SS Peter & Paul.